yay! the sun has finally come out after almost two weeks of rainy, icky weather. it's a holiday weekend, which means bar-b-ques and seaside trips to herald the official start of summer. i always think that the real barometer that summer has arrived in the city is the pedicure. now that it's in the 80s, girls and women of all ages are breaking out their open-toe sandals and lining up to get pedicures at the nail salons. 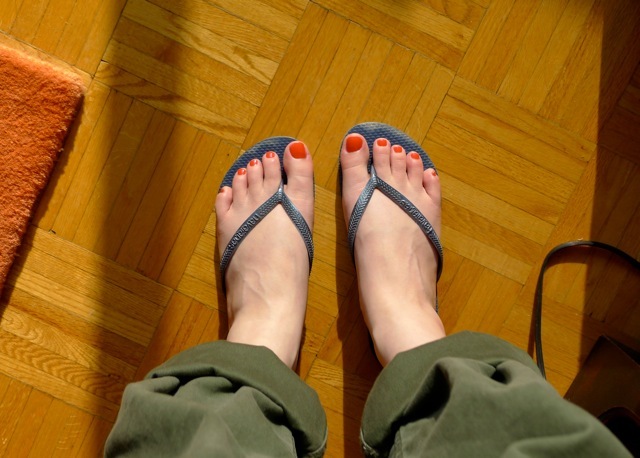 just walking down the street today, i saw three women (one with her spa 'flip-flops' still on) rocking some seriously bright and colorful toe polish (fluorescent orange, anyone?). i'll probably be living in my new Hope striped shirt all weekend and trying to keep bbq sauce off of it. excuse the close-up of my feet. color is Essie 'escapades'. Lovely! I'm wearing a similar shade of Essie polish on my toes too! Have an awesome weekend! I'm coming to NY for a really short visit. I was going to email you to see if you wanted to meet up for drinks, but then I realized that I don't think I'll have enough time! Booo!! What a great outfit. I'm a huge Havaianas fan, BTW:). Also YSL lipgloss. Also, are those gladiators pearlized leather? Patent? jennifer: i love bright colors, especially for toes :) aww that's too bad! we'll have to meet up another time. have a lovely Memorial Day weekend! LPC: thanks! Havaianas are a godsend. i wear them around the apartment and you just reminded me that i need to get another spare pair when mine wears out. isn't YSL lip gloss great? perfect lip color for summer. the gladiators are a sort of brushed leather in a muted pale gold. they're so comfy! You're so right. I consider pedicures to be my gauge for when summer begins. I just started my weekend with a bright pedicure (opi red) at my favorite spa. Have a lovely weekend. Your outfit is very cute. great summer outfit! (esp the hat!) I never paint nails but your post makes it quite tempting, a pop of color is always a must for summer outfits. The Hope tee is one of the most perfect striped tee's I've seen, great picks! Hello! Sadly, still raining here in the Pacific NW but we are getting a few much needed sun breaks. This post cheered me up, especially the mention of bbq's - yum yum. I love your polish color but I'm with Nanashi on this one. I don't paint my fingers or toes. Had too many bad experiences with yellow stained nails. Have a wonderful weekend! The Hope top looks so good! I got some new Hope pants yesterday, I'm really happy with them. I like you Panama hat too, I wish I could find something like that. Such a great look with a striped tee! lindsay: sounds perfect - pedis are such a nice little treat! Nanashi: thanks! i'm going to wear the Hope shirt till it is completely falling apart. it's perfectly slouchy! Garderoben: ooh - which ones did you get? summery ones? this is my first clothing purchase from Hope - i've only bought their shoes in the past. i hope it washes and wears well! oh, I love the nail polish color! The perfect shade for warm weather, and I can imagine it would look great with the olive pants and striped tee. I got the News trousers in khaki grey, from the pre fall collection. They're pretty summery, but I they'll look good with a sweater and lace up boots for fall and winter too! S: thanks! can't get enough of essie colors. Garddroben: ooh. some of Hope's fabric blends with synthetics put me off. i love their slouchy, easy silhouettes this season though. and the pirate shirt has the perfect stripes!